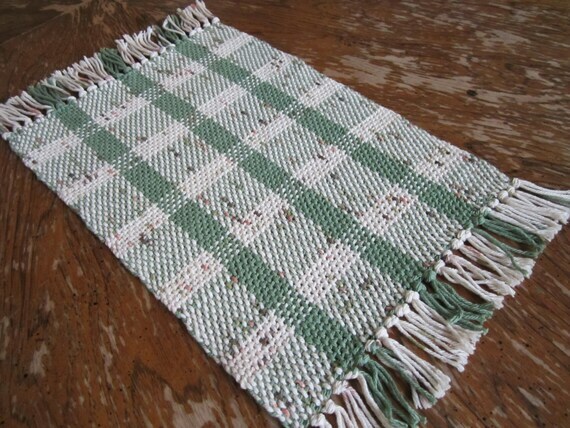 This cotton table runner is hand woven in a lovely rustic design. It is also a great size for any use, with the woven body being almost 15 inches long by 11 inches wide. Plus it has approximately 2 inches of fringe on each end. It is long enough that it makes for a great center piece runner, but not so long that it could get in the way. It is done in a lovely rosemary green and natural colored plaid. Plus the natural colored yarn even has lovely specks of salmon pink, green, and brown in it. Giving it a lovely country look. Which makes it perfect for going with whatever decor you are doing your table in. It would be wonderful for using on your dining table or coffee table. Or anywhere else you would like a touch of rustic charm. It would be a great gift for yourself or for someone you know who loves hand made treasures.